You're approaching a crossroads. The traffic lights have failed. What should you do? You're approaching a crossroads. The traffic lights have failed. What should you do? 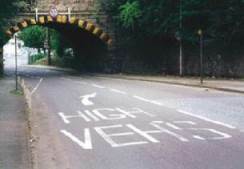 To perceive hazards effectively you must maintain the best visibility possible (i.e. not wear sunglasses, and keep your windscreen clean), use the correct road positioning for your vehicle so you can see dangers ahead, be aware of traffic around you, and know what road signs and road markings mean. For example, place names are painted on the road surface so that you can change lanes early at busy junctions and in complex road systems. 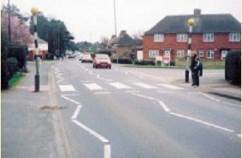 Markings such as ‘keep clear’ help you to know where not to queue because there might be emerging traffic. If you are riding a motorbike, be careful if you are filtering through traffic as other vehicles could be obscuring emerging traffic’s view of you. 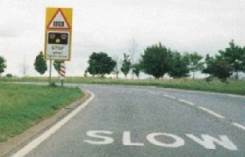 Signs such as this indicate sharp bends, in this case, to the left. 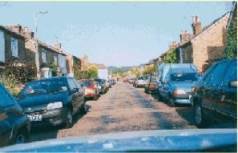 You will see signs such as ‘one-way’ which means that if you turn into it, you can’t turn around and come back out – you must continue to the other end, or turn off into any side streets. This sign indicates that the vehicle is a school bus. Take extra care if a school bus is parked on the side of the road picking up or dropping off children. Children have less road sense and can dash across the road without looking. 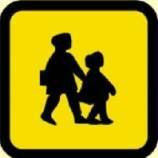 Reduce your speed and watch for early signs that children might be waiting to cross. The edge of the carriageway is marked by a solid white line. 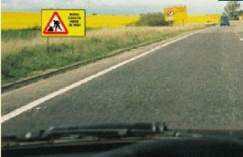 You can use lines, reflective road studs and signs to help guide you along the road. 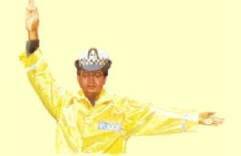 This signal from a police officer means you should stop. If it’s at a junction, stop at the line. Police officers may need to direct traffic, for example, at a junction where the traffic lights have broken down, or if there’s a special event or incident. The main hazard in this image is the cyclist crossing the road. You also should be aware that there are traffic lights. When the traffic lights turn green, the white car ahead of you in this image should wait for the cyclist to pull away in case the cyclist wobbles. This makes it less likely that the car will clip the cyclist and cause an accident. When following a cyclist towards a t-junction or a right turn be aware that they may want to turn right and therefore could signal and move in front of your vehicle. 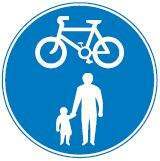 Watch for the cyclist looking over their shoulder as this should give you a clue as to whether they want to turn. 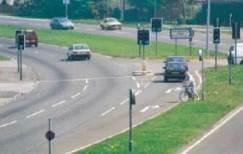 If you are approaching a junction and a cyclist is turning, let them turn first. This also applies if you want to turn left and you want to overtake a cyclist going straight ahead just before you turn left; wait for them to go through the junction. 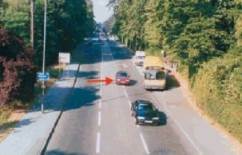 The main hazard for the red car in this image is the bus which could pull out in front of it. Large vehicles have more and larger blind spots where it’s difficult for them to see what’s there. 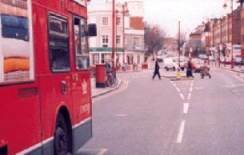 The bus on the left in this image could be obscuring the view of pedestrians which might try to cross in front of it. The bus also could pull away if it doesn’t see you. When driving through a bus station you should keep a look out for people getting off buses. Bus stations are busy places. If people are in a rush they may not always look properly before getting off the bus. You must always keep your speed down and be aware that danger may suddenly arise when you least expect it. 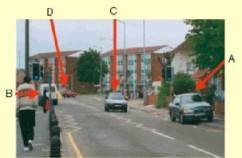 The driver of the red car must wait for the pedestrian in the road to cross; drivers must give way to pedestrians already crossing the road. If you pass these flashing amber warning lights you can expect to see a school crossing patrol. Children can often dash out in front of cars unpredictably as they don’t have as much awareness of the road. 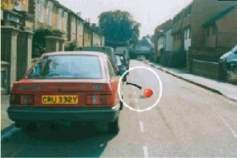 If you see a ball bounce out in front of your car, assume a child might chase after it. Slow down and be prepared to stop. The same would apply if you saw a bicycle wheel sticking out from between parked cars. As you approach this overhead bridge you should be cautious of large vehicles such as lorries and buses coming the other way as they will move to the centre of the road. You might have to stop and wait. 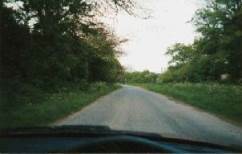 When driving on an unlaned road such as the one in the image below you should be aware that large vehicles could come around the corner and there might not be enough room for you both to pass safely. 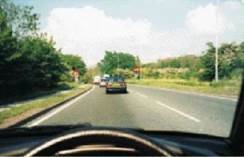 You should reduce your speed so that you can stop in half the distance of clear road ahead of you. Also be aware that pedestrians could be walking on the side of the road. 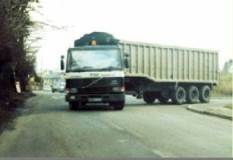 Lorries and other long vehicles may have to pull out onto your side of the road in order to make a manoeuvre, such as in this photo. Be patient and wait for them. 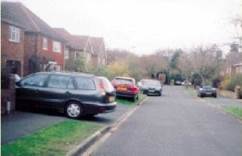 In this narrow road drivers should be cautious and watch for children running into the street, other drivers opening their car doors, and cars pulling out. When you see this sign it indicates there’s a bend with a level crossing immediately after. 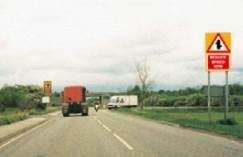 The size and positioning of the sign indicates that perhaps the lights and barrier arms cannot be seen until you are quite close to the crossing. When approaching a road hump, slow down or you could damage your suspension. Road humps are installed as traffic calming measures to reduce the speed of vehicles to make it safer for other road users. 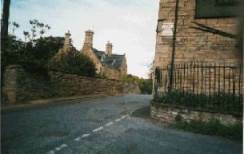 Other types of traffic calming measures are chicanes and narrowings. You will find these markers on a builder’s skip or a large goods vehicle. They must be fitted o vehicles over 13 metres long, too, and are reflective so they can be seen in the dark. In this image the road user at A has caused a hazard by parking on the zigzag lines approaching the pedestrian crossing. Parking here is illegal. It blocks the view of pedestrians crossing the road and the view for the pedestrians of traffic approaching the crossing. At this junction it is difficult to see each way because the building is so close to the edge of the road. You may have to edge forward slowly until you can see clearly each way. If there are buildings opposite you might be able to see vehicles reflected in the windows. 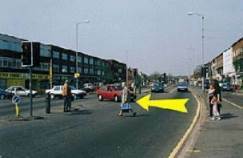 When approaching a pedestrian crossing, slow down and be prepared to stop. You can also see a side road – don’t block the side road if there’s traffic waiting to emerge. If the traffic lights have failed at a junction you should treat it as an unmarked junction. If you are driving along a road and you see a driver reversing you should sound your horn and be prepared to stop if you think that they haven’t seen you. Modern vehicles have thick rear pillars for improved crash protection but, unfortunately, this restricts rear visibility. Read ourguide to reversing here. If you are approaching a junction on a main road where there is not a central reservation or marked turning bay there could be stationary traffic waiting to turn, or traffic that has turned onto the carriageway that is speeding up. Be prepared to stop if you need to. Overhead gantry signs will indicate which lanes you can use and which lanes you can’t, as well as if a lane is closing. The central lane in this diagram is closing and you must move to the left. The two right lanes are closed and you must not use them. Roadworks can damage your vehicle if you drive through them too fast. They also create extra hazards for motorcyclists and scooter riders who may swerve to avoid potholes and uneven surfaces, and will need to drive much more slowly on loose surfaces. If you are driving and see a roadworks sign such as the one below you should be ready to slow down or stop as there could be workers on the road, slippery surfaces, one lane closed, or machinery blocking the road. If you are on a dual carriageway and you see a roadworks sign with a lane closing be wary of cars cutting in. If you are on a motorway and behind a slow-moving lorry that you want to pass, and it’s travelling in the middle lane you should approach with care and overtake it on the left. This sign is found on road works vehicles. In a contraflow system you should reduce speed, choose an appropriate lane and keep the correct separation distance. 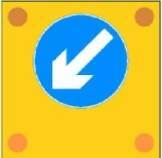 In a contraflow system you will be travelling close to oncoming traffic and sometimes in narrow lanes. You should obey the temporary speed limit signs, get into the correct lane at the proper time and keep a safe separation distance from the vehicle ahead. When traffic is at a very low speed, merging in turn is recommended if it’s safe and appropriate. More roadworks guidelines and rules are here.